CINCINNATI, Ohio — The Kroger Co. said today it is recalling Kroger Lite Mayo in 32-ounce plastic jars with a “Sell by” date of SEP-25-09 sold in Kroger stores in Southwestern Ohio, including Cincinnati and Dayton, and in Northern Kentucky and Southeastern Indiana because the product may be contaminated with Salmonella. 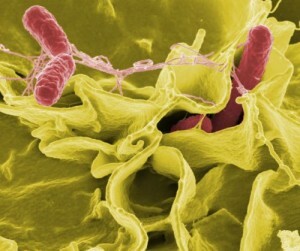 Salmonella is an organism that can cause serious and sometimes fatal infections, particularly in young children, the elderly, and persons with weakened immune systems. Healthy persons infected with Salmonella often experience fever, diarrhea, nausea, vomiting and/or abdominal pain. No illnesses have been reported in connection with the product. Kroger Lite Mayo sold in 32-ounce jars with a “Sell by” date of SEP-25-09 under the following UPC Code: 11110 66090. Customers who have purchased the above product should not consume it and should return it to a store for a full refund or replacement. Salmonella is an organism that can cause serious and sometimes fatal infections, particularly in young children, the elderly, and persons with weakened immune systems. Healthy persons infected with Salmonella often experience fever, diarrhea, nausea, vomiting and/or abdominal pain. For more information, please visit the Centers for Disease Control and Prevention’s website at www.cdc.gov. Consumers who have questions about this recall may contact Kroger toll-free at (800) 632-6900. For more information, please visit www.kroger.com/recalls.